I will create a feature request to provide a means in the strategy builder to rearrange the order/sequence of both inputs and variables in the strategy builder after they have been already used in a condition/action set. I will update this thread when I have the feature request number. Thanks for bringing this up again. I had requested the exact same thing here. @PaulH: It would also be great to also allow EDIT of Inputs although they are in use (as long as the strategy is not running). The feature request to allow for sorting and organizing inputs and variables already exists and it is identified as SFT-2065, "Allow parameter and variable sorting w/in the Strategy builder" and your vote has been added to it. 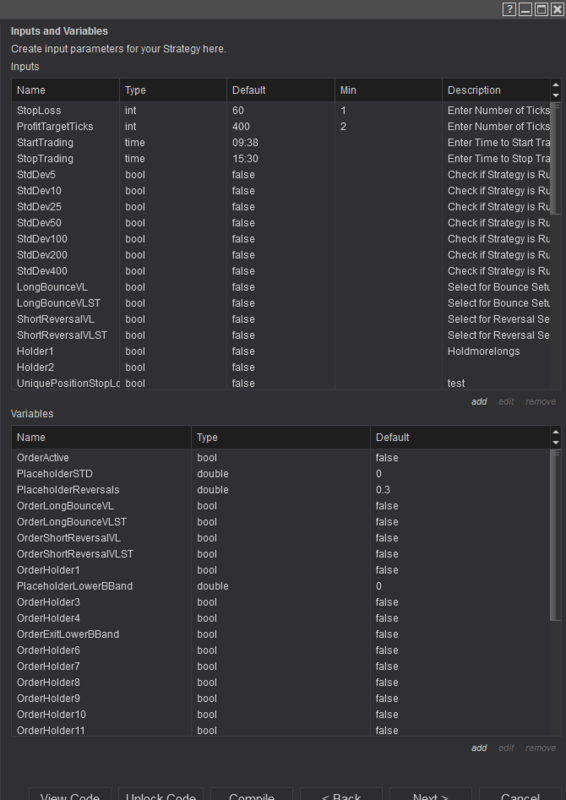 Hello NT-Roland, The feature request to allow for edits of variables and inputs already exists and is identified as SFT-2974, "Strategy Bldr Variable edits", your vote has been added to it. Thank-you both for your interest in improving NinjaTrader. All times are GMT-7. This page was generated at 04:07 AM.